We may like our smart home devices, especially the ever-evolving and perennially useful smart speaker, but we still don’t quite trust them yet. That is the finding of a widespread new survey by the consumer research firm MusicWatch, which released a survey detailing the privacy concerns that many consumers still harbor about their Google Homes, Amazon Echos and the particularly challenged Apple HomePod. Nearly half of the 5,000 U.S. consumers aged 13 and older who were surveyed by MusicWatch, 48 percent specifically, said they were concerned about privacy issues associated with their smart speakers, especially when using on-demand services like streaming music. That lack of trust could potentially present a challenge to widespread adoption of music streaming services, despite the fact that the survey indicates more than half (55 percent) of respondents are using their smart speakers to listen to streaming music services more often, while two-thirds are listening to more online radio such as Britain’s popular Absolute Radio and America’s gold standard, National Public Radio. On the flip side, the survey shows that smart speakers have the potential to bring people together in new and unexpected ways. Russ Crupnick, the managing partner at MusicWatch, said the firm’s focus groups show that families are gathering to listen to music at home, which hasn’t been a trend in some time. In another useful data point for streaming services, MusicWatch found that 90 percent of music streamers have listened to or created a playlist. Paid subscribers to services like iHeartRadio or Spotify were most active with 80 percent listening daily and 50 percent listening to a playlist every time they stream music. Among those who listened to a service’s playlist, 90 percent have created their own personal playlist in the past 90 days. However, MusicWatch also found that content trumps the creator. 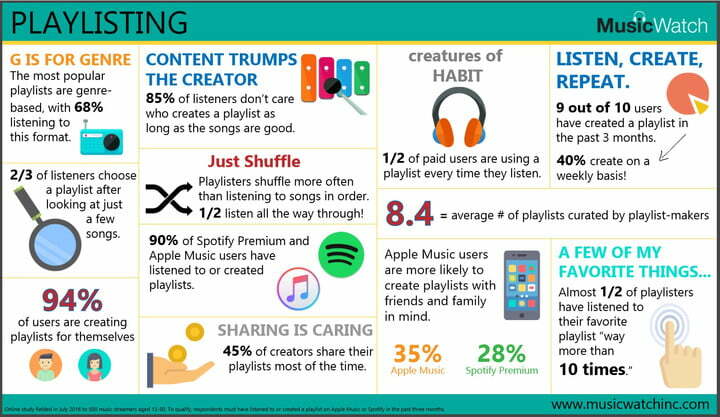 Unlike popular DJs who have a personal following, 85 percent of streaming music listeners don’t care who creates a playlist as long as their jams are good. While the use of streaming services and playlists remains very popular, nearly 80 percent of music streamers also listen to old-school style on AM/FM radio. “Ease and convenience” and “discovery,” both hallmarks of traditional terrestrial radio, were cited by many as reasons to use playlists when they stream music. Regardless of how you listen to music, MusicWatch’s results show that Americans are still getting their groove on.